A reception is a celebration that follows the wedding ceremony. Receptions include many rituals and traditions, but they most often include a meal, music, and dancing. But have you ever wondered why the party after a wedding is called a "reception?" The word reception literally means the action or process of receiving something, but what on Earth does that have to do with getting married? A reception is held as a sort of welcome for those who attended the wedding. The couple receives their community, i.e. friends and family, for the first time as a newly married couple. Likewise their friends and family receive the newlyweds as a married couple. Weddings were not nearly as extravagant a century ago. In Western culture, up until World War II, wedding celebrations were typically held in the bride's home and the family's financial standing dictated the style of the reception. A wealthier family might host a fancy ball, while a middle-class family might host an afternoon luncheon and tea. Around the turn of the century dance halls became more popular and the guest lists began to grow, as the bride and groom were no longer limited by the number of people their homes could hold. Wherever the reception was held, guests were greeted with a receiving line in which the bride and groom, hosts and parents would greet every single guest. Today wedding receptions commonly take place in banquet halls, hotel ballrooms, wedding venues, and church and community halls. Smaller wedding receptions might occur at a restaurant or in a backyard. The receiving line, which is quite time-consuming, has since faded in popularity. Today wedding parties are introduced with a grand entrance presented by the wedding band or DJ. Wedding toasts are generally made before dinner is served. 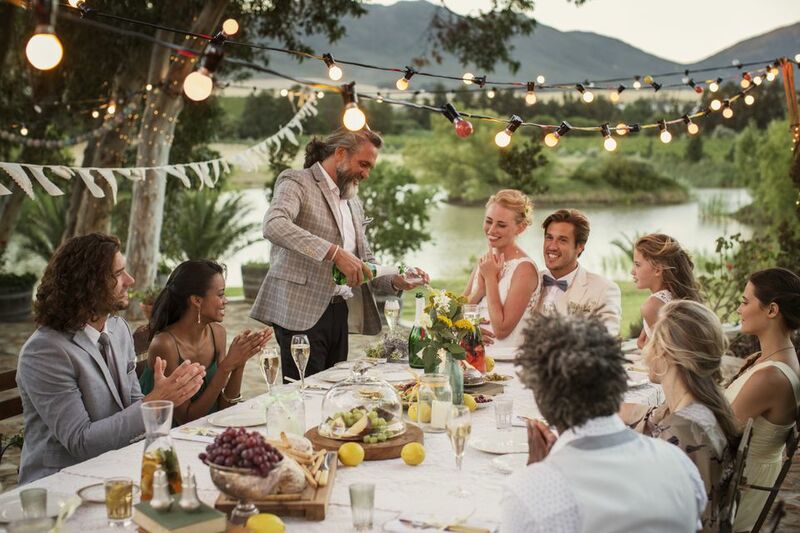 Toasts often include a welcome by the bride's father and speeches by the best man and maid of honor. Within the last century, traditional dances have fallen to the wayside and dancing has become more of a free-for-all. Modern weddings include the newlyweds' first dance as a married couple and parent dances. Choreographed dances are also becoming more popular. Entertainment is provided by a band or DJ. Sometimes fire artists and professional dancers are hired to provide additional entertainment. Culture plays a key role in wedding food. Often, a three-course meal is served that includes a salad, entree, and dessert. Buffets are also common options. It all really depends on the couples' tastes. Later on in the reception, the bride and groom will often ceremoniously cut the first piece of cake and feed a bite to one another. Wedding cakes are usually elaborate multi-tiered cakes. Couples today often choose to cut costs by having an extravagant fake display cake and serving guests a sheet cake. The groom's cake, which originated in the Southern United States, is becoming an increasingly popular trend around the country. Traditionally the pristine, white cake was considered too light for male tastes, so a second cake, usually a liquor-soaked fruit cake, was offered as the groom's cake. Today groom's cakes are works of art that are modeled after his favorite sport or hobby. In 2014, the average cost of a wedding, including the ceremony and reception, was approximately $30,000. Geography plays a significant role in costs. For example, a wedding in Manhattan costs around $76,000, making it the most expensive place to get married in the country. Weddings in Arkansas and Utah, however, cost the least, with average costs of $18,000 and $15,000, respectively.